We prepare product price forecasts (quarterly) for use in our economic evaluations based on continual surveillance and monitoring of a number of benchmark product prices, locally and internationally, in conjunction with our view of the relevant political and industry trends and circumstances. We also consider the views of operating companies, financial institutions, oil & gas marketing companies and other consulting firms. 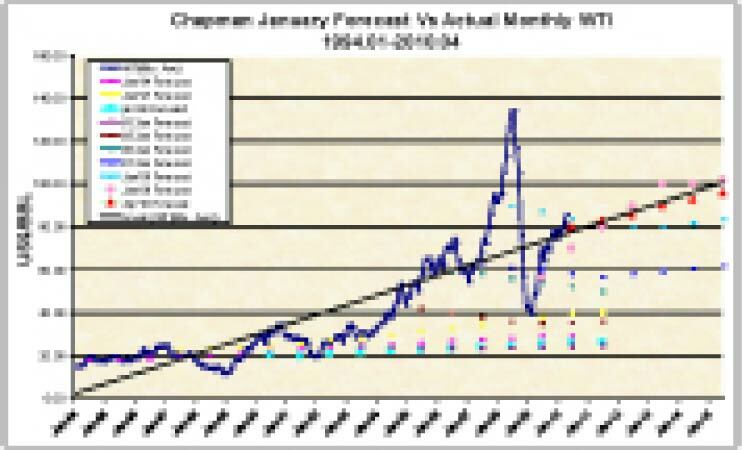 In preparing our forecasts, we place emphasis on historical long term trends. 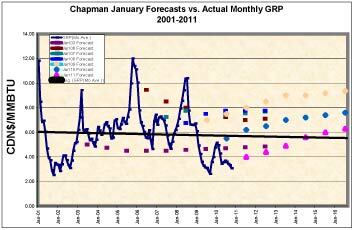 We schedule specific predictions for the near term, considering current data, gradually approaching our long term trend projection over the first few years. The forecast is extended with the application of a general escalation at the same rate as our cost escalation, for a maximum of 15 years from the report effective date, after which prices and costs are held constant. We have presented historical graphs showing our annual forecasts prepared for January 1st since 2001, for WTI oil price and AECO-C gas price compared to actual prices over this period. These plots demonstrate that our forecasting has been very consistent over the years and compares well to subsequent actual prices, with the exception of recent high oil price volatility which was not predicted earlier.